Up for review today is the Davidoff 702 Series Aniversario Special T. It’s a bit of a new take on the classic Davidoff Special T, and augments the blend most significantly with the Ecuadorian Habano 702 wrapper. 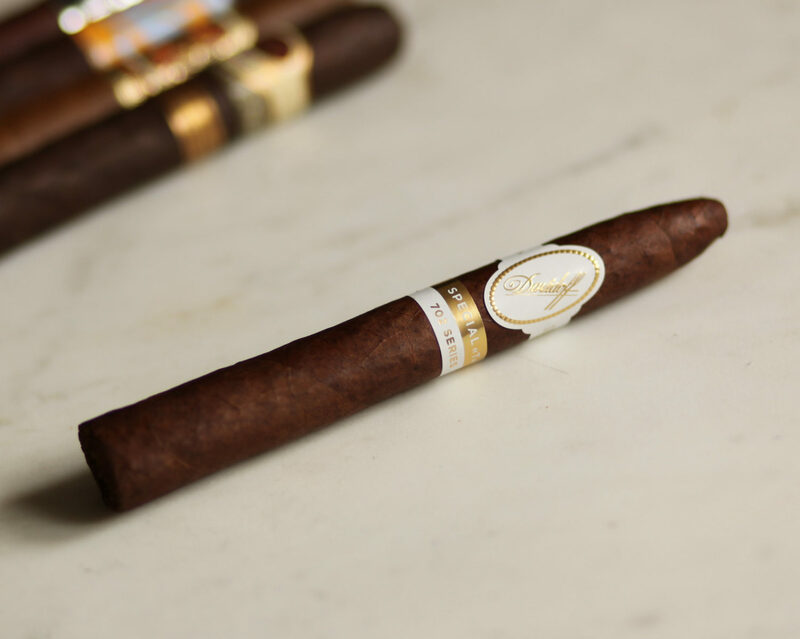 Anyone reading this site knows I’m a fan of Davidoff, with their cigars winning some of my top ratings of all time (the Davidoff Millennium Blend Short Robusto scored a rare 94 rating). It’s a double-edged sword though, as I also hold Davidoff to a very high standard of quality, and some of their cigars just haven’t lived up to it. Let’s find out how the Davidoff 702 Special T fares. The Davidoff 702 Series Special T is about as attractive as they come, with the standard white and gold Davidoff band with an additional white and gold secondary band denoting the 702 series. The outer 702 Habano Ecuador wrapper is the color of marbled dark chocolate and fairly smooth to the touch. When squeezed, the cigar has a moderate amount of give, and seems packed mostly consistently though it gets a bit denser near the cap. This is obviously no surprise given the torpedo format. After using a straight cut, I test the draw. It’s just about perfect, maybe a touch restrictive. The cold draw brings forth notes of sweet earth, and I pick up aromas of dry cedar, earth, and some mild spices off of the foot. The 702 Special T kicks off with mild bodied, mild strength smoke. 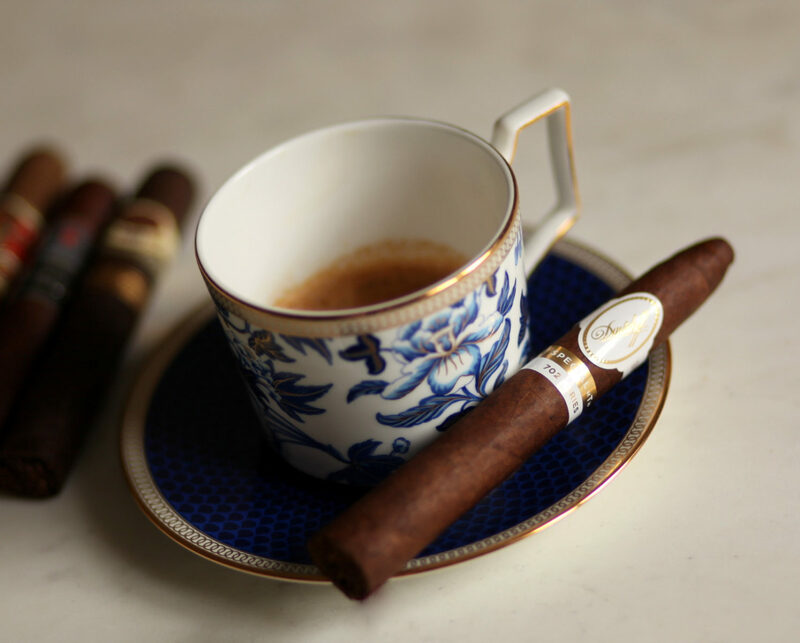 A twinge of spice on the tip of the tongue, that famous Davidoff mustiness, barnyard, dry paper, and some light black pepper and coffee notes. The profile overall straddles right between sweetness savory, making for an interesting start. Smoke production is good, and the cigar had no trouble staying lit. At half an inch in, I’m beginning to worry that this cigar will be essentially a redo of the regular Davidoff Anniversario Special T, which to me lacked much character or complexity. Thankfully, I soon pick up some subtle shifts in the profile, including a subtle floral note (which I’m a sucker for) and a bit of salt. An inch in, the burn is straight and the cigar has developed an almost completely white ash. Flavors have finally settled into something straightforwardly enjoyable: the salt has morphed into something resembling buttered popcorn, the wood is a bit less dry, and the floral notes I sensed earlier are now a consistent part of the profile. Heading in to the second third, the burn is still completely straight, with the white ash dropping at one inch intervals. Strength wise, the cigar has climbed into medium territory, with spice, Oak, and cinnamon bread making up the bulk of the profile. At this point, I’m impressed by the complexity, though I’m not yet impressed by the bouquet of flavors, which is often out of balance (some flavors not complementing others). The cigar progresses more or less in the same way until the final third, where the strength and concentration of flavors increases slightly, likely the result of the vitola’s tapering. The spiciness from earlier is replaced by strong black pepper, and the coffee note shifts to espresso. All of this over a foundation of dried wood. The experience between this and other cigars like the Millennium Blend is clear. Like most Davidoff cigars, the Davidoff 702 Series Special T presents a fairly complex, enjoyable bouquet of flavors, along with flawless construction. Still, it’s fair to say that roughly half of the cigar struggled with an imbalanced profile. Since it was such a consistent issue, in my mind the $30 price range isn’t justified for this cigar.